Ingredients: French baguette, goat cheese, zucchini (courgettes if you’re Kiwi, Aussie, or English-er, better yet a Commonwealth citizen), polenta, applewood smoked bacon, avocado (duh), Tapatio hot sauce, black pepper, cilantro. Pointer #1: Simmering is pretty difficult on most backpacking stoves, and accordingly, things cook faster (and louder) than anticipated. This means preparation is key and having things sorted will prevent you from burning your precious/sacred backcountry deliciousness and enable you to eat a mult-step meal all at the same time. 1. Fire up your stove, cook bacon. 3. Slice veggies. Cook zucchini if you have the patience. 4. Spread goat cheese, apply bacon, polenta and veggies. 5. Dash with black pepper and Tapatio. Pointer #2: Remember, there’s no need to strictly eat crappy dried foods in the backcountry to cut weight. 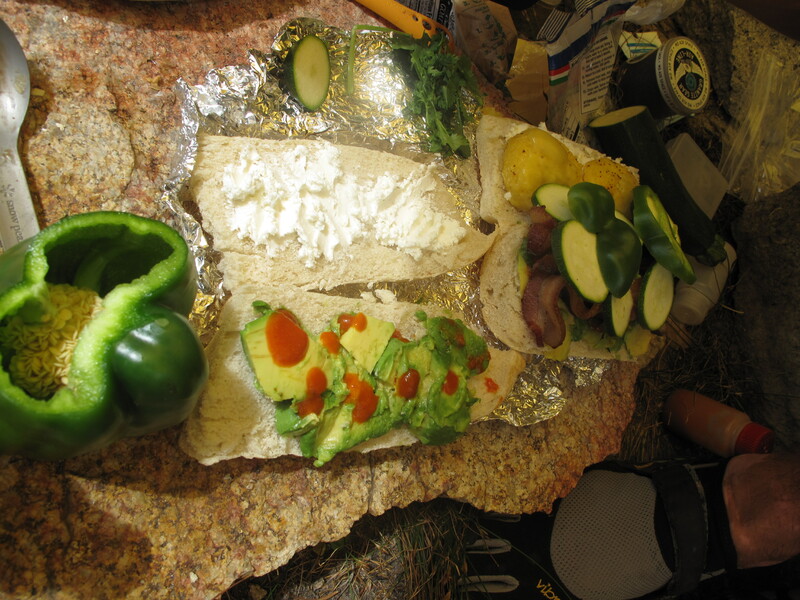 Eating well means living well and that also makes for happy campers and more savage adventurers. Bring fresh vegetables like zucchini and bell peppers, always eating the heavier ones first. Stay hungry friends, and keep charging.